In Great Yarmouth, our Early Help team is very lucky to be based in the same building as our social work colleagues and work closely with them to ensure smooth transfers between teams for families. The Early Help managers and step down champions take turns to base themselves in the social work office for half a day every week. At these in reach sessions families which are being considered for transfer to early help are discussed. We start to develop a plan about what is the right service and the right timing for the child and their family. For example, if a direct piece of targeted support is identified for an EHFF practitioner, then it is arranged that one of the team will attend the step down meeting with the family to discuss in detail what it will look like for them. Also, to ensure that they understand the EHFF service. Alternatively, if a transfer to a universal FSP is agreed the process team may agree to attend a step down to support our partners in setting up the FSP plan. “Having weekly in-reach from early help managers sitting within the assessment team allows real time to reflect on live cases. It provides the early help team with good knowledge of the issues, difficulties and challenges and to identify what support is required for children and their families. It gives a more effective approach and is about getting the level of support and threshold right at an early stage. We track and confirm these arrangements at fortnightly transfer meetings." A recent survey of the Early Help Collaboration Hub in Great Yarmouth received a very positive response with 104 returns. Feedback comments were equally as positive: 76.92% people said that they had attended the collaboration hub already, and as a result have met new people, learnt about other organisations and are exchanging valuable information. 47.87% said that the hub helped support their specific case with the remaining percentage showing that they didn’t have an actual case to bring. 89.13% reported that cases had been prevented from escalating. 86.32% find the Early Help Bulletin useful of which there have been 69 so far in as many weeks. Great Yarmouth has recently held their 11th Network Meeting. Each meeting has a theme with at least two guest speakers from a local support service. The theme is decided through discussions at the local Early Help Hub Steering Group based around cases coming into the Hub. To date, we have had Network Meetings around topics such as: mental health, safeguarding, ASD, hoarding, cultural awareness, universal credit and tackling local ASB though positive activities for young people. 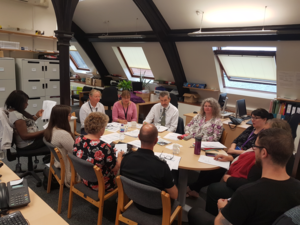 At the recent ASB meeting, various support services, activity providers and local employers attended with presentations from Sergeant Julie Johnson Police, Neighbourhood Manager Dan Hastings, Nick Hazeldene, Youth Worker at MAP (along with two young commissioners) and Charlie Smith from the YMCA. The session was well attended with 65 people overall. Everyone positively participated in discussions and activities looking at perceptions of ASB, current youth activities and what is working well opposed to what activity providers need to change in order to move forward in meeting the needs of young people. Kiri, Practice Consultant within the East LAC Team has been working with L who has had a particularly hard time over the last year with both her physical and emotional health. L has been supported over time to make sure that she's receiving the correct therapeutic input as well as support with her physical health. She has since felt confident to complete her Duke of Edinburgh Bronze Award and has enrolled onto the Silver Award. This is fantastic news given L was unable to participate in her Physical Education lessons due to her physical health. On top of this success, L was voted top student in a recent baking competition at her High School, once again boosting her confidence. This is just one of many positive success stories of a young person supported by the LAC Team. We look forward to hearing about more in future editions of Improving Times . In April 2017, we set up the After Care Service to replace Supporting Progressions. When families are closed to Early Help Family Focus, sometimes it is felt that they may need a bit of extra support and monitoring to ensure they are following plans put in place by their practitioner. Identified families are offered the After Care Service and an agreement is made that our Partnership Officer will call the family on a regular basis depending on what is best for their circumstances. There are 10 families open at present and three have been closed as the family no longer require the support. They feel that they can cope alone now. A group for grandparents, who have their grandchildren living with them full time, has been recently set up. The group offers peer support and advice. It meets at MESH on the first Wednesday of each month 10-11.30am and on the second Tuesday of each month at Newtown Community Centre 7-8pm. Support is provided by Neighbourhoods that Work, Ormiston and the CPCC Team. The first meeting, in July, identified that both grandparents and grandchildren can feel isolated, finding it difficult to establish friendships. As a result it was decided to have a picnic at St George's Park, Caister for the August meeting, with Caister Children’s Centre offering the use of a room in case of bad weather. As it was exceptionally windy, we adjourned to the Children’s Centre to eat. The children had a great time playing together and the families stayed far longer than expected. The evening meeting has, so far, been attended by grandparents of teenagers whilst the morning session has been accessed by Grandparents of younger children. 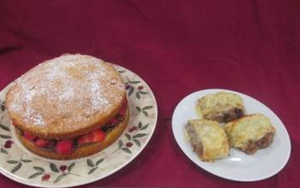 The two groups obviously have very different needs but both have benefited from having the opportunity to talk to people who understand the difficulties, and joys, of bringing up their grandchildren. For any enquiries, please contact Caroline. A program to address physical and emotional abuse by young people towards their Parents/Carers. This program ran for the first time as group for families in the Great Yarmouth Area. It started with six Families, one was a Young Person in a Care establishment. The programme directly works with the young person and the parent to address the conflict and gives both parties a say so that both can have a voice and be heard. It looks at ways to address the behaviours and the impact it has on the family units, both complete a work book. The programme is twelve weeks, taking two hours per session, some sessions are with the young people and parent and others separated. Parents and carers learn how to have their say in a non-confrontational way and set appropriate boundaries and consequences. The young person learns how to be respectful, be accountable and recognise their effects on others using a restorative approach to address conflict, it is a collaborative process. The Norfolk 0-19 Children and Young People's Health Service moved into Havenbridge House in August. 'Since the Health Visiting and School Nursing teams have moved to Havenbridge House it has enabled the Assessment Team to seek support with new referrals coming in and offers us that face to face interaction and relationship building that ensures positive joint working. "In addition to being able to speak with the Duty Health Visitor at any time, each Tuesday the Safeguarding Lead and a Manager from the Assessment Team meet and discuss any new cases, or cases that are concerning either service. Therefore, similar to being in the same building as our NEHFF colleagues, we are able to talk about cases in real time and reduce delays in decision making and identifying the appropriate services for supporting families’. There will be a welcome party on Wednesday 27 September 11am-2pm on the third floor of Havenbridge House. Recently, members of the CPCC team joined up with the Great Yarmouth Neighbourhoods That Work Teams to attend a Community Development Learning Programme. The course was designed to look at values and principles of community development, ways of working, how our roles compliment each other, different approaches and clear strategies & tools to help in our work reflecting upon our practice. The outcome was to have a better understanding of what we do, why we do it and to understand the role of community development approaches. It was an enjoyable experience, not only in a learning aspect, but to have the opportunity to get together and hear more about each others work and how we can continue to liaise together in the future to help our local community. Everyone received an accredited CPD Certificate in Community Development and Engagement.